The thick internal shell of a cuttlefish is called a cuttlebone. It is made of calcium carbonate and contains numerous gas- and/or water-filled chambers. The eyes of the cuttlefish are extremely well designed. Its pupils are “w” shaped, and they can focus both forward and backward, giving the cuttlefish all around protection. When frightened or attacked, the cuttlefish releases ink that forms a dense cloud in the water column, allowing it time to escape. The cuttlebone enables the cuttlefish to control its bouyance in the water column. 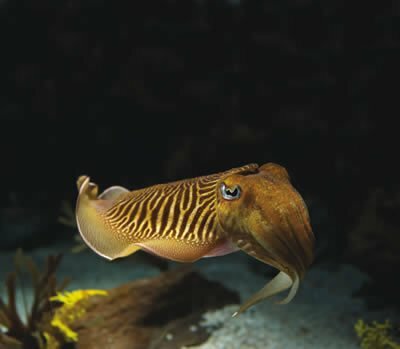 The cuttlefish is not a fish; it is a mollusk. The cuttlefish can rapidly change its skin color to either hide from predators or communicate with other cuttlefish by means of special cells called chromatophores. The cuttlefish has three hearts to pump its greenish-blue blood to its gills and body. The eggs of the cuttlefish are laid in clumps and are often coated in ink by the mother, camouflaging them. 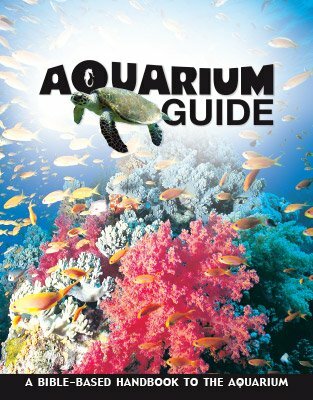 With fun facts about more than 100 animals, this long-awaited Aquarium Guide includes beautiful pictures and reveals the incredible facts and design features that point to our amazing Creator. This handy size guide is excellent for school field trips and family trips to your favorite aquarium!